I returned yesterday to Canada from a whirlwind tour of the Holy Land with The Canadian Church Press. As I’ve written earlier, our first days were spent visiting Caesarea, Nazareth, Capernaum, and Galilee. On Wednesday and Thursday we turned our attention to other biblical and historical sites. On Wednesday we visited the Banias area, an area of Israel which was, in biblical times, an area devoted to the Greek demigod Pan. 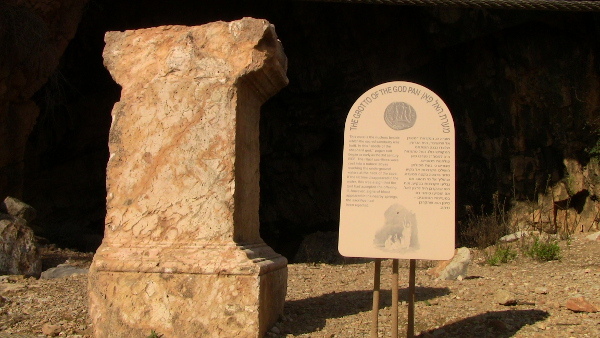 There we saw, in the ruins of Caesarea Philippi, places which once housed shrines to Pan and to Zeus—poignant symbols that, as Habakkuk reminds us, such idols are profitless, mute things (Habakkuk 2:18-19). Zeus, the “king of the gods,” lies dead and silent, his temples laid waste. Yet the Church of Jesus Christ stands to this day, the gates of hell never prevailing against it (Matthew 16:18). 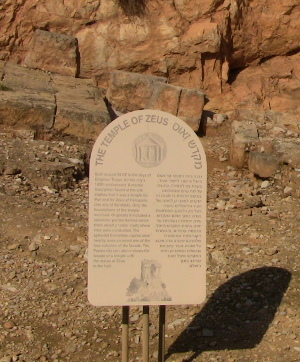 The remains of the temple to Zeus at Caesarea Philippi. That last reference is something Jesus promised Peter following his great confession that Jesus is the Christ, the Son of the living God (Matthew 16:16). Fittingly enough, that confession was made in the same region we visited when we saw the ruins of Zeus and Pan’s shrines—in the region of Caesarea Philippi (Matthew 16:13). The same story of Peter’s Great Confession includes the note that, “from that time Jesus began to show his disciples that he must go to Jerusalem and suffer many things and suffer many things from the elders and chief priests and scribes, and be killed, and on the third day be raised” (Matthew 16:21). So too those of us visiting Israel would also soon go to Jerusalem to follow Christ on His way to the tomb. But before that, we would also visit Crusader-era Muslim ruins at Nimrod Fortress on Wednesday, and the site of Jewish rebellion against Roman authorities at the remarkably preserved mountaintop fortress of Masada on Thursday—reminders that conflict over possession of the Holy Land is nothing new. The former is in the top-most Northern part of Israel. The latter is as far South as we travelled during The Canadian Church Press’ tour to Israel. The same day we visited Masada, we also visited Qumran, where the Essenes once lived. This Jewish sect, which lived in the desert by the Dead Sea, was wiped out by Romans sometime around 68 AD. While the community was destroyed, their library was not: the Dead Sea Scrolls are believed to be the remains of their religious texts. Among these scrolls are scrolls or fragments of scrolls of all Old Testament books except Esther, and date back to the second century before Christ, making them the oldest extant copies of the Old Testament in existence. 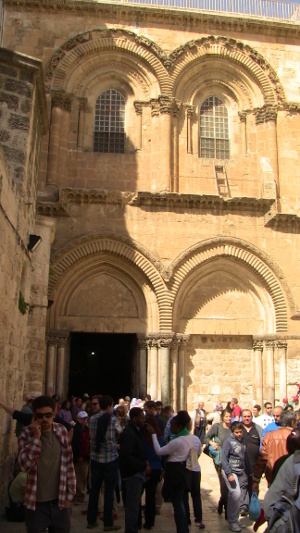 The entrance to the Church of the Holy Sepulchre. Thursday night we arrived in Jerusalem, and there we would stay in a hotel just a few blocks from the Christian Quarter of the Old City. Earlier in the day on our way to Qumran, we visited the traditional site of Jesus’ baptism in the Jordan River, and on Friday we visited Bethlehem to visit the Shepherd’s Fields and the Church of the Nativity. Friday we also visited the Western Wall, the retaining wall which surrounded the Temple which Christ Himself visited two millenia ago. On Saturday we followed Christ’s path to the Garden of Gethsemane at the Mount of Olives, before turning to the two places most popularly believed to be the sites of Christ’s crucifixion and resurrection. The first of these is the Garden Tomb, found near a cliff face which resembles a human skull—Golgotha, the “place of the skull,” it is believed. 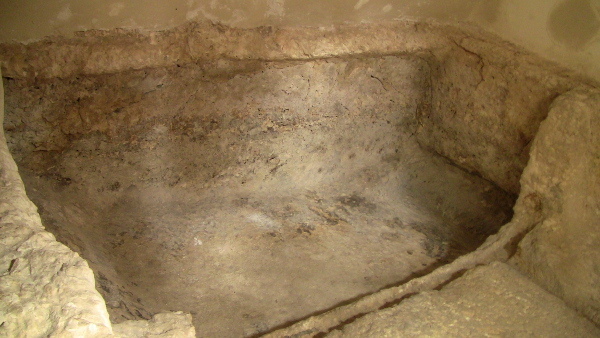 This tomb, with its clear groove for a rock to seal the entrance, has been accepted by many Protestants as a likely candidate for the tomb of Christ. But tradition has long held the Church of the Holy Sepulchre to be the true location of the tomb. And this place too we visited. Regardless which (if either) of these sites is the true tomb of Christ, as our guide at the Garden Tomb reminded us, one thing is certain: whatever tomb Christ once lay in is empty. He defeated death! He rose from the dead! Whether you ever visit the Holy Land for yourself or not, of that you can be sure! Inside the cave at the Garden Tomb: the area where the body of Jesus is believed to have been placed.